Offers > Olapic > Learn how CMOs can leverage customer photos for their brands. 500 million photos were shared per day in 2013 and 1.8 billion photos are being shared per day in 2014. That’s 75 million per hour, 1.25 million per minute and 20,833 per second. Olapic’s new visual commerce white paper places this content explosion in context. We filled it with data that matters, insights from our experience with over 150 brands and retailers, and strategic guidance for companies ready to plan their approach to the visual commerce opportunity. 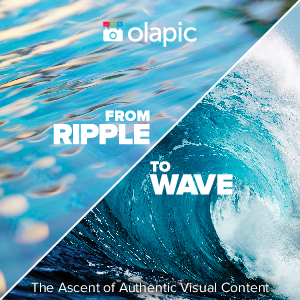 Download From Ripple to Wave: The Ascent of Authentic Visual Content now.